If you could meet one of the CSI's, who would it be? The fans pick: All seasons! 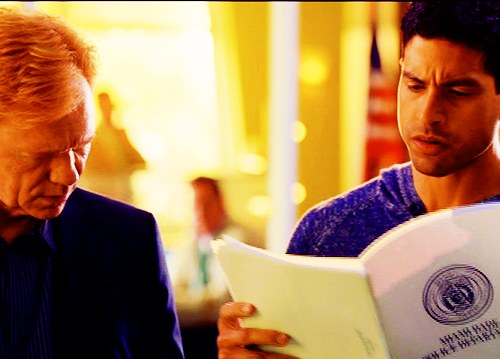 Who would be the cutest CSI: Miami couple? Calleigh Duquesne is best in..
How would you rank the seasons? I am really desperate to find an episode, Plz Help me! Do u know which episode this is from? Please answer! What's the name of the Assistant State Attorney that Horatio used to date? I love the CSI franchise, definitely my favorite series of series. I'm a true crime junkie, and I love forensics and am fascinated with the entire process of solving crimes. I know these shows aren't 100% real in how things are done but that's not really the point, is it? That's what Forensic Files is for, and which I also love. I don't mean to make this a battle between all shows, but one can't help but obviously compare them. It has been a while since I had been back in Miami. A lot of things have changed. I have grown up, toured overseas a couple times, and I have made a life for me. I have friends that I have known since I joined the army and they were coming to live in Miami too. Although, some of them were getting married and I was still my single self which I did not like very much. The first thing Mark and I were going to was treat ourselves to was some good food. We did not even want to go set our bags down at his fiancee's house. We wanted to eat something good! Lola got to come home after a few days in the hospital. It was nice to have her back. Some of the other kids were staring at her oddly because of her neck and arms. But she seemed not to care too much. Whenever she noticed that they were staring to much, she would turn, and make a funny face at them. But it was really good to have her back. We were inseparable during the days. Wherever one went, the other would follower. We were really close. "Lola, please wake up," someone said, "please do not leave me like everyone else has!" I felt someone squeezing my hand. I looked over it was Kyle. "Kyle," I said as I busted out in tears, "you are here and alive! Are you okay?!" I thought I would never see him again. I thought they would have hurt him as much as they did to me. "I am fine," he said as he wiped a tear away that slipped from my eyes. I leaned over to give Kyle a hug and my ribs brushed against the arm of the bed. Man, it hurt; but it was not has bad as what happen to me. All I can do is stand there and watch as they take her away in an ambulance. "Come on, son," some cop said as he approached me, "I will take you to the orphanage." "No, I want to go to the hospital," I stated; "I have to be there when Lola wakes up!" "I am sorry but I have strict orders to take you directly to the orphanage," he said. "It is alright," Horatio said as he came to my side, "I am heading to the hospital and I can watch after him." After getting in the car with the cop, it was clear that we were not going back to the orphanage. We were headed somewhere else. Some part of town that was probably not a good place to be in. I looked over at Lola who was still sulking in her spot. She had not even noticed where we were headed. "Lola," I whispered, "where are we going?" "What in the world," she said as she looked out the window, "where are we going?" Juvenile detention was so boring. I had nothing to with Lola being gone. I mean usually we would just sit and hang out. But now that she was at hospital there was not much to do. I did not know any of the other kids around here. Most of them looked like freaks anyways. After the incident I came back here to the juvenile detention. But I stayed over night then I had to go talk to Horatio. I cannot even describe what happen. It was all a blur. I just acted on that moment and did not think about anything else. Before I could realize it the cops had surrounded the whole place and Lola was laying on the floor. I had no idea how she had gotten there and why she was conscious. "Lola, it is over," I said, "you can wake up!" I saw Horatio and he had his gun pointed at one guy while a cop was putting handcuffs on him. "Hey guys, that Lola girl is back and she has someone with her," the smallest of the guys yelled, "who is he, Lola?" "I thought he was friend," I said as I busted out crying, "I thought I could run to him but he wants to help you all!" "I want to help," Kyle said oddly. "Here, I will take the girlie while Ace here shows you around," the small guy said. "Kyle," I cried as I tried to get away from him. A 30 day challenge for 3 CSI's (original, Miami, and NY). SEASON 10: What episode is this from? Win an autographed photo signed by William Petersen and the "6 Guys from Chicago"
List reasons you like CSI Miami.